Short story collections are like tackle boxes, and as readers we’re like big, literate fish. But we’re fish who’ve grown arms and legs and we live on land now. However, unlike our aquatic friends, we want to be caught, and that’s what we’re looking for when we’re slapping around in the tackle box—we want a sharp, exciting ride. A good tackle box will have all sorts of lures: simple hooks, jiggly, fake worms, maybe some fancy flies, or even a bit of Strike King™ Pro-Model stuff. And as we’re rocking in our chairs, our eyes wide and our jaws slack, we’re hoping for that sharp surprise to tear through our cheeks and reel us flopping across the carpet. Luckily for us, the tackle box that is Brian Allen Carr’s debut collection Short Bus is loaded with material that’ll snag hard on our throats, cheeks, foreheads—hell, even our fingers. Sometimes all it takes is a simple graze and we’re tight on the wire. In the opening story Running the Drain, Carr wastes no time in snapping his pole back, setting a dark, pounding, addictive tone deep into our jowls. Carr writes with a clarity that is both elegant and brutal. When you employ short, declarative sentences, there isn’t any room for shadowplay; everything is honest, bared. His characters live by these same rules, flexing their weaknesses, confiding their often dark desires. “I thought how easy it would be. Like an accident. Him falling into the water, then splashing around in circles as his left hand pulled across the surface and his nub pierced through clean. I reeled up the slack in my line. I set my pole in a holster. By and large the characters in this collection are broken by time and circumstance, some by birth, and they slink and limp along the Texas/Mexico border in search of simple moments in which they can seize at least a sense of the control they’ve relinquished somewhere along the way. They are recognizable strangers, each and every one of them. While the doses of darkness and damage come fast and often in this collection, there are stories that succeed in lightening the mood, so to speak. And after having my face smashed into the surf behind a speeding boat for several pages—but delightfully so, mind you—I’m always happy to hear the gears downshift and feel the fun bubbles rush over my body. 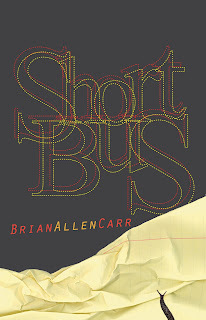 The story that best embodies this shift is the titular Short Bus, a first person account of the adventures that come with teaching a special education class. It’s funny, honest, sad, and, in my opinion, it’s the best balanced piece in the collection. It’s also one of the longer stories, and it’s the one whose end saddened me the most because I didn’t want it to stop. You hear me, Carr? You’ve got a novel waiting for you in that story. Or at least a healthy novella. The strengths of Carr’s writing are many, notably his attention to detail, his wonderfully crafted characters and settings (you can taste blood and dust in many of these stories), and my personal favorite—his ability to surprise, regardless of a story’s content. Whether following friends on a trip to Mexico, looking over the shoulders of two hit men, or feeling the pressure of a young boy growing up beneath a sick mother and a hardened older brother, we never know what’s coming around the corner, or what that shiny thing is that’s twirling through the water.